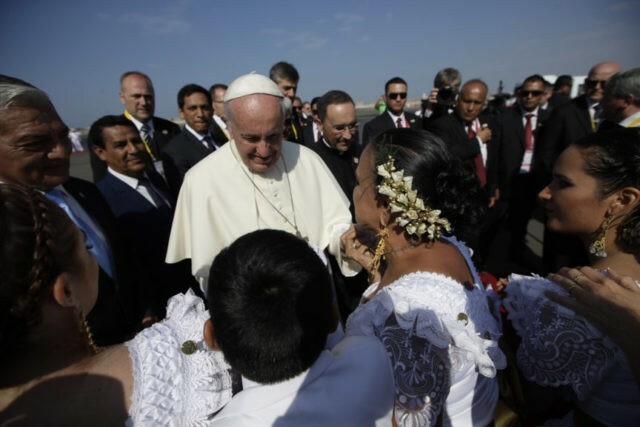 TRUJILLO, Peru (AP) — Pope Francis consoled Peruvians who lost their homes and livelihoods in devastating floods last year, telling them Saturday they can overcome all of life’s “storms” by coming together as a community and stamping out the violence that plagues this part of the country. Francis travelled to an area of northern Peru that is frequently hit by “El Nino” storms and was inundated in 2017 by flooding that killed more than 150 people and destroyed hundreds of thousands of homes. Some residents are still living in tents. Extortion is common in northern Peru, especially around Trujillo and areas hardest hit by the floods. Bus drivers who don’t pay often see their minibuses torched. The violence is so prevalent here that Peruvian Nobel laureate Mario Vargas Llosa wrote about it in one the recent novel “The Discreet Hero,” inspired by a Trujillo crime involving a businessman who refused to pay. In Trujillo the pope found a frustrated population hoping his visit can quicken the pace of reconstruction from the floods, the worst environmental disaster to strike Peru in nearly two decades. Francis is the second pope to visit the coastal city that is periodically drenched by disastrous rains caused by a warming of Pacific Ocean waters. Pope John Paul II came here in 1985, during a decade in which Peru was afflicted not only by just El Nino floods but also hyperinflation and political violence. “Peace should arrive through dialogue and not violence,” the late John Paul II said during his visit. Bocanegra lamented that one year after the floods many streets in Trujillo are still contaminated by fungus and debris from the storms, estimated to have caused several billion dollars in damage. He vividly remembers how the street in front of his house turned into a river so forceful it pulled furniture with its current. “We were left trapped,” he recalled. Images of Peruvians forming human chains to help one another cross flooded roads and remarkable stories of survival from those who emerged alive from mudslides captivated the nation for months. Officials say the floods impacted nearly 2 million people. The trip to Trujillo came a day before Francis is scheduled to return to Rome after a weeklong visit to Chile and Peru. The pontiff’s presence in Chile was marred by protests over the Roman Catholic Church’s response to priest abuse and fire bombings of churches — including one more overnight. But the pope has received a decidedly warm welcome in Peru, a deeply Catholic country where thousands have lined the streets wherever he travels to cheer and greet him. Associated Press writer Nicole Winfield reported from Trujillo, and AP writer Christine Armario reported from Lima, Peru. AP writer Franklin Briceno contributed from Lima.